Why do some people climb mountains? I've often heard their response, "Because it's there". You could also ask an artist why they choose to paint certain subject matter. For me, I sense a need to capture what I saw and how the scene made me feel. With this old building, it was the sunlight on the signs with different fonts. I could tell that the fonts were hand painted and it reminded me of the times when I would write signs for my dad. He was the manager of a meat department and I would go to work with him during the summers. He'd have me hand write the signage for the various meat sections and include the prices. It was my first attempt at advertising and it was supposed to capture the shopper's attention. As an adult, I saw this building daily because I worked across from it in Louisville, Kentucky. The fonts were a challenge to paint by hand and maybe that's why some people climb mountains. These old buildings may not be around forever, so I paint them because they are there. The original oil painting was purchased by a collector, and this was my first print sale of 2019. Happy New Year! I took this photo at Christmas time before the building became a restaurant. It was a peaceful scene and I just thought I should take a photograph of the angels. The restaurant is called 73&Main and the food is great! It has won local and state awards for the food and the overall appearance. They purchased a print from my painting of the Mount Pleasant Milling Company and my photo of these angels lighting up Mount Pleasant, NC. If you are on highway 73 stop in for the food and view my art. I encourage you to try the steak and the desserts are also excellent. And if you need a haircut, the Mt. Pleasant barber shop has an original painting of mine hanging inside too. Merry Christmas everyone! It is not my intention to tell a sad story but this will come from my heart. Until now, the only person I've ever told is my wife and what I'm about to say still saddens me after all these years. When I was an undergrad student at the University of Louisville, our art professor assigned us the task of creating a drawing somewhere in a public location. This could be a park, city sidewalk, or somewhere on the banks of the Ohio River. I selected a quiet local park not too far from the university. I parked my car, set up my easel, and proceeded to draw a section of a creek that was moving slowly through the landscape. My professor had shown us a way to hold vine charcoal in a manner that would create more loose mark making and this was my process. It was about 4pm and I was almost finished when I noticed several geese floating along the edge of the creek. Rather than try to draw them I decided to relax and watch them move along on this quiet afternoon. What happened next was both surreal and shocking. Out of tree line across the water five men appeared all dressed in white shirts and pants. I do not think they could see me. Suddenly, one male decided to pick up a large rock and throw it on top of one of the geese. My peaceful moment with nature was now under attack. The U.S. Marine in me yelled at them as loud as I could. I started running across the water towards them screaming like a madman. I can't remember exactly what I was saying but apparently they were shocked to see and hear me running towards them. They ran very quickly into the woods. After some time I decided to return to my easel. As I walked past the lifeless goose, I just could not understand why they did this. To this day I still don't understand. I also don't know why I chose that location to draw. Was this event something I was supposed to see? Was God showing me this for a reason? I still have many questions even after all these years. I'm not even sure if I was able to finish the drawing that afternoon but I did pack up and leave. The original is framed in our house today. Finally telling this story helps me some but I will always think about that day whenever I walk past my drawing. Thank you for taking the time to read this. To see a larger image of my drawing from that day view my gallery of drawings for A Quiet Stream. I was sad to see this old building demolished. It has always been sort of a landmark of history here in this small town. I'm glad I painted it when I did. I think artists have a unique role. Artists can capture a scene that others often overlook until it is gone. This was the Mount Pleasant feed mill and it operated as recently as the last 10 years. North Carolina has quite a few of these old structures but the elements and "progress" may soon bring their demise. Our family went to the Tweetsie Railroad amusement park during the summer. While walking past the front of the train I noticed the engineer shining the brass bell. I asked my wife to take a photograph because I thought I might paint that scene on canvas. After returning home, I developed the film and sat the photo by my easel to begin the oil painting. At first I considered changing the train engineer's red hair color to perhaps a brown. I decided to paint his hair red just as it was in the photograph. After finishing the oil painting I placed the image on my website. A few weeks later I received an email from a lady who wanted to purchase the original and three limited edition prints. She said that the engineer was her son and the painting would be a Christmas gift for him. In December my wife and I drove to Banner Elk to deliver the painting in person. 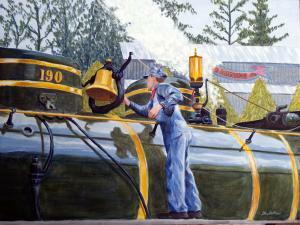 His mom introduced us to the engineer with red hair in my painting called Reflecting on Tweetsie. I'm often asked to tell that story so I thought I would share it with others. I’ve been counting my blessings this week and I'm thankful for music. I grew up near farmland and my small AM radio could only pick up a classical and country station. The classical music had no lyrics so I’d imagine a story while listening. I’d place the radio under my pillow and lower the volume so my parents wouldn’t take it away. At age ten we moved to a bigger town and I played trumpet for six years in school. Today that radio would be considered an antique and maybe I am too. I enjoy listening to movie scores while painting now and I’m thankful for technology that makes it enjoyable like ear buds and Spotify. And yes, I still listen late at night while painting in the studio. So make the time to relax and enjoy some good music everyone, and Have a Happy Thanksgiving. A few years ago I painted a mural for the City of Concord to honor our armed forces. This is the painting that I submitted for approval. 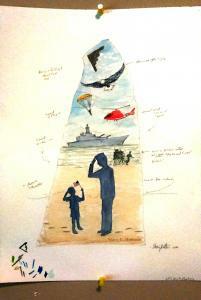 I painted the five branches of our military on a nine foot triangular rock and the unveiling included a military flyover. The mural can be seen at the A. M. Brown Operations center in Concord, NC. Happy Armed Forces Day. I saw this cross in the sky while hiking up to Chimney Rock North Carolina. No other person seemed to notice this as I was the only one taking a photograph. The clouds soon moved away.I didn't notice the face until later that day. It was October 25th, 2015 about 2:30 pm. It was a good day.